A story of treasures discovered, inspiration found …and a life changed. In 1985, while shopping in an antique store in Bath, England, Cynthia Murphy came across a beautiful and very old Asian embroidery. It spoke to her and became the first of many historic textiles she would collect. This was the beginning of a passion and a craft that would change Cynthia’s life and career. Cynthia’s eye for beauty, and her appreciation for how different cultures develop their stylistic approach and techniques, has driven her to collect textiles on a global basis. Within each piece, she recognizes social influences— fashion, ritual, symbolism, status, honor— that go beyond aesthetics and deepen the cultural connection. This extra dimension beyond beauty fuels Cynthia’s true passion for collecting. She first selected rich, intricate, 18th and 19th century embroideries and brocades from France, England and Italy. Then, as her curiosity was piqued, she added Asian needlework, Turkish weavings and Persian silks. Cynthia’s special interest in Art Deco and Arts & Crafts design expanded the scope of her collection. 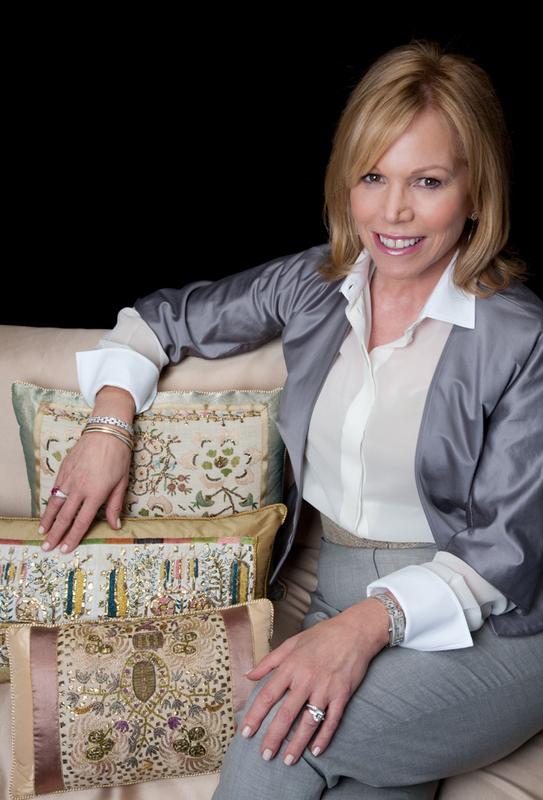 After graduating from the New York School of Interior Design, Cynthia set her sights on finding a way to leverage her education, love of design, and passion for antique textiles into a venture that would breathe new life into these historical treasures. 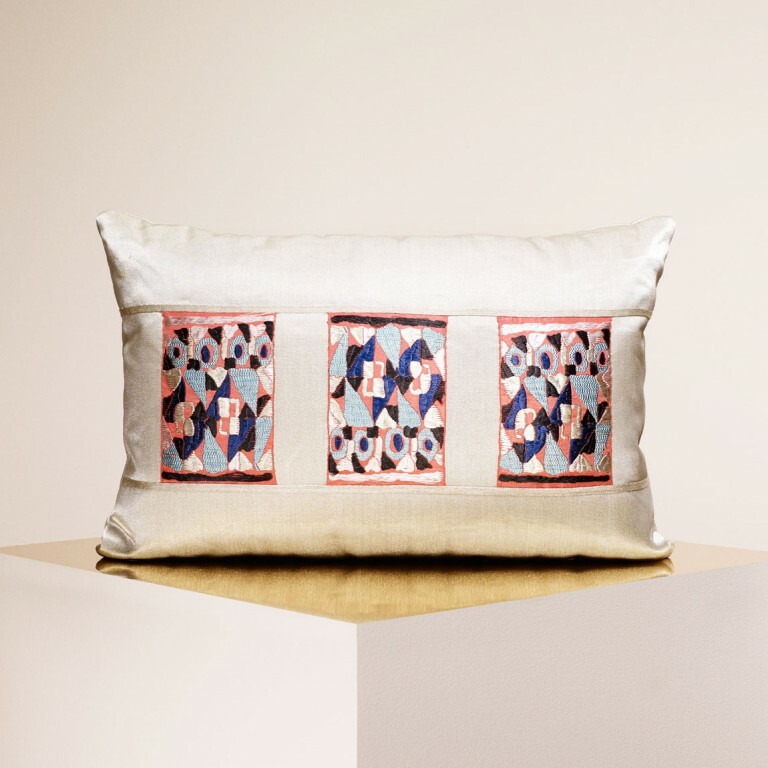 Her appreciation for the value that these textiles had in earlier cultures and societies gave her a vision of creating an object of art— a one-of-a-kind pillow, blurring the lines between eras and designed to play a key part in the interiors of today. Her approach is to focus on a historic piece, then add complementary elements. In this way, she creates something unique, as well as modern. Cynthia’s design signatures are rich textures that repeat and contrast, a gentle play of historic patina with unexpectedly fresh colors and delightful mixes of materials. 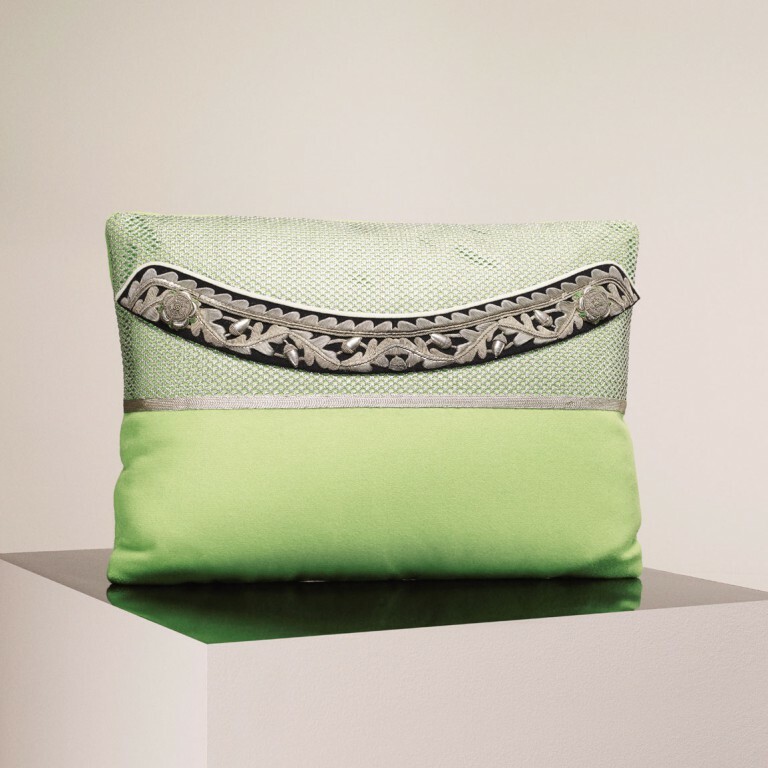 The end result is a once-in-a-lifetime possession—something as simple as a pillow and, yet, so much more. Each historic textile has a hidden story and is researched by experts and documented for its role and place in history. And each is hand-stitched by experts. Today, the collection is offered to the design community, professionals, and novices alike, as a way of inviting people into the passion of Cynthia’s design imagination. Cynthia Murphy’s creations bring both the past and present into your own designs for today and beyond. 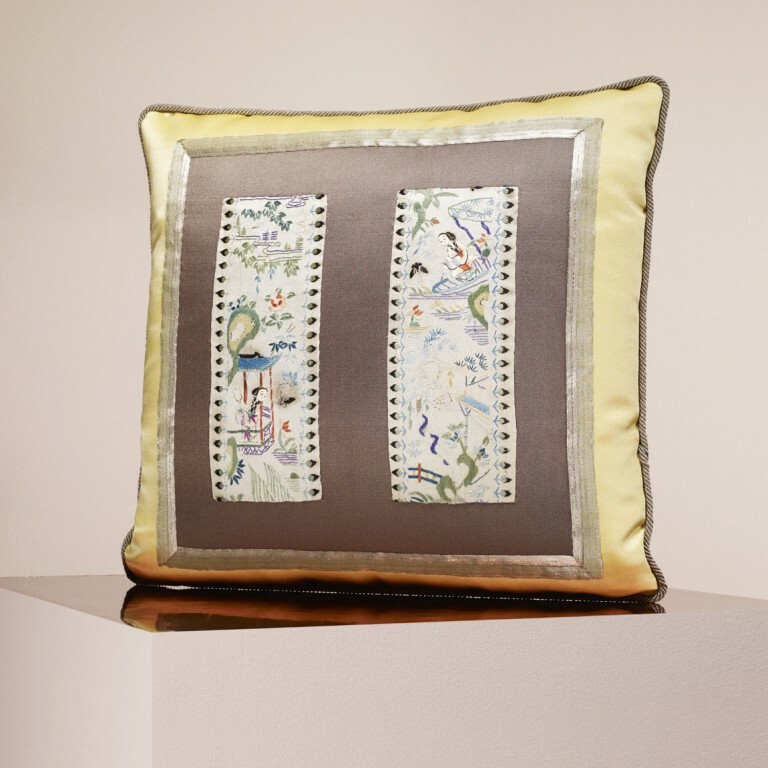 Cynthia Murphy’s pillows are a creative blend of rarity, color and design. They reflect the rich history of antique and vintage textiles, mixed with luxury materials in a modern way. Each adds a unique statement to a room. And, as you draw closer, each tells a story of it’s own. American Arts and Crafts, 1915, Embroidered panel, reminiscent of Gustav Stickley designs, hand embroidered with all silk threads in rich tones of gold displaying diamond shapes on stems with a Tudor Rose in various shades of pink. 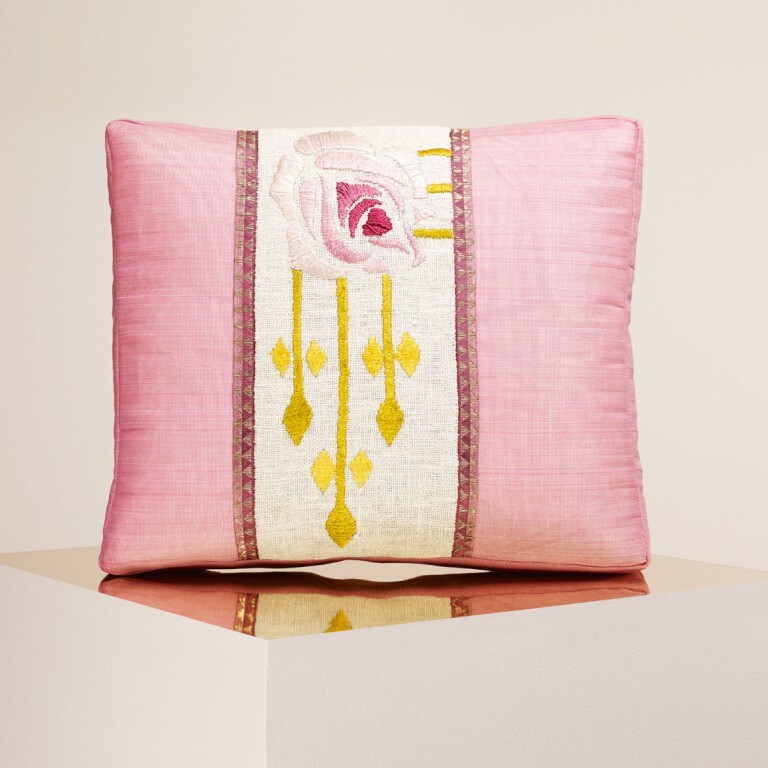 The cushion is finished with vintage French trim with multiple shades of pink accented with a gold chevron pattern. 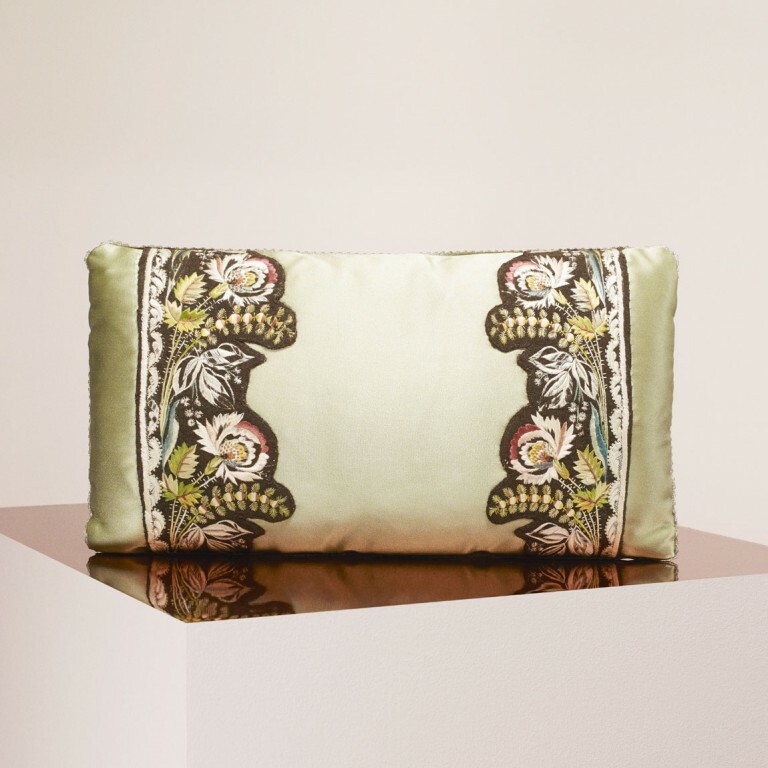 A contemporary azalea horsehair complements the left and right sides of the cushion. 19th century Piña cloth in vibrant pink finishes the sides and back. A 1920’s Art Deco brocaded Ribbon with an abstract pattern cut into three separate rectangular panels colored in a palette of aqua, cobalt, silver and black on a rich coral background. The three panels are bordered horizontally with lines of applied vintage silver metal braiding. 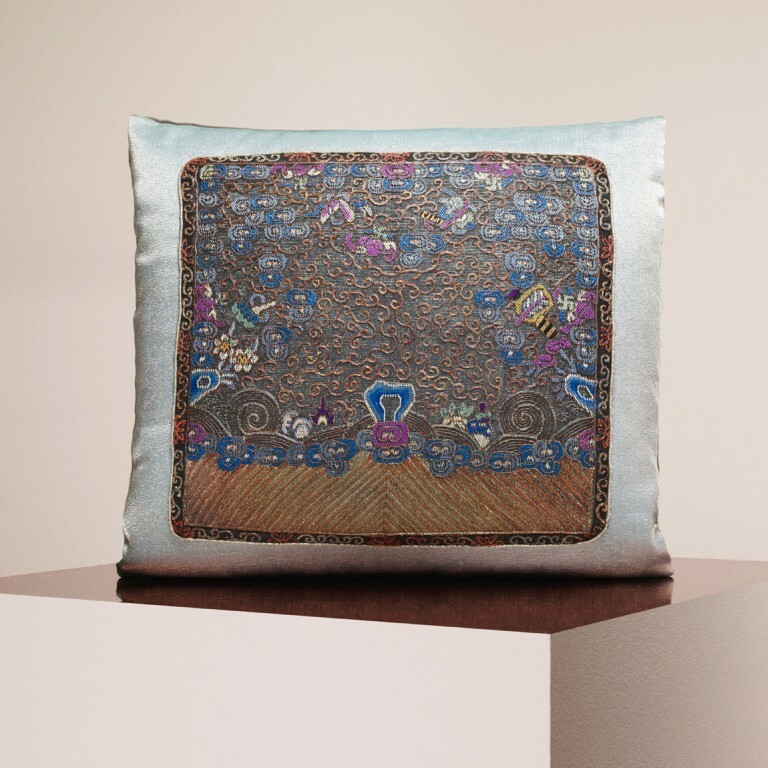 The ground fabric of the pillow is vintage silver lame fabric. A 1920s French beaded, embroidered and tulle panel from a lady’s dress. An unusual design depicting sea plants in rounded shapes embroidered in colorful shades of purple, cherry, green, blue and light caramel and finished with white and black beading surrounded by stems of sea grass in black silk tulle and black beading. 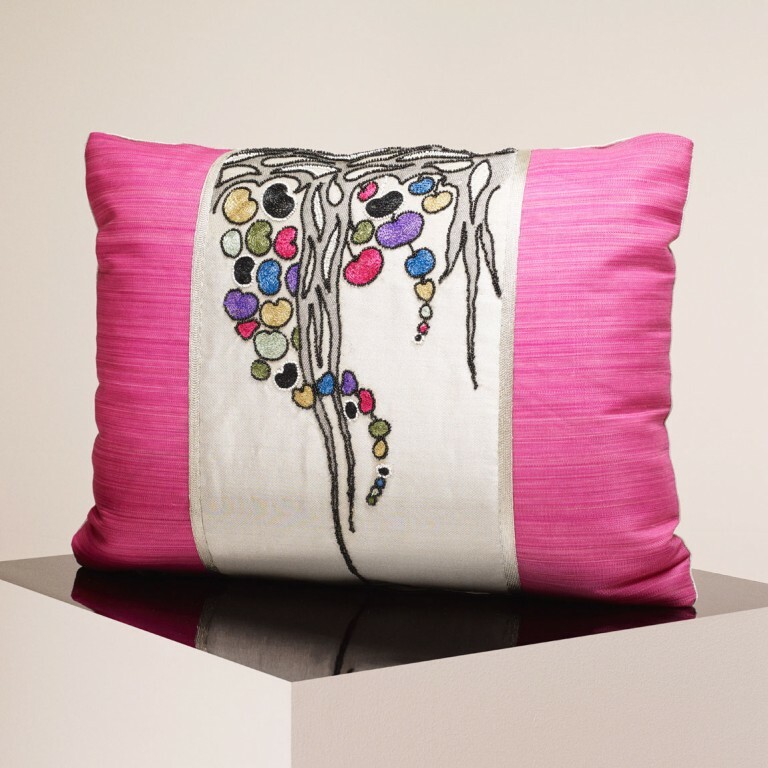 The outside borders of the cushion are done in woven horsehair in bright fuchsia. Vintage silver metal braiding borders the left and right side of the panel. 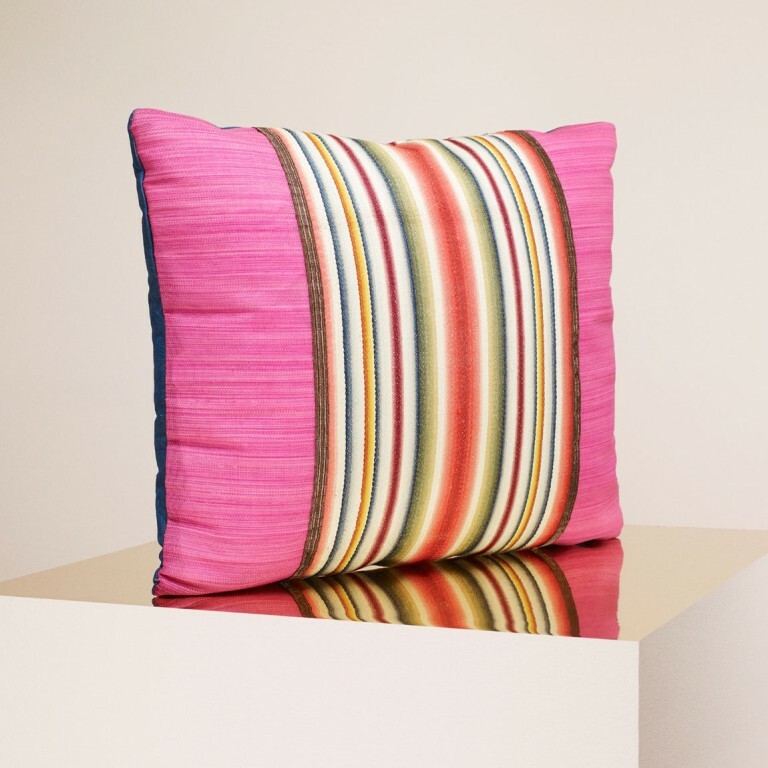 The outside portions of the cushion are made up of fuchsia horsehair. An English 19th century embroidered military collar band made up of acorns, tudor style roses in silver metallic bullion with apple green silk thread mounted on vintage silver fishnet metal mesh with a bright green felt underlay and finished with a horizontal strip of vintage silver metal braiding mounted over bright green felt. Antique Chinese embroidered rank badge. Worn on the front and back of overcoats during the Ch’ing Dynasty. A very unusual design with a black open weave canvas background in Florentine stitch in bright polychrome silks and couched with numerous metallic cooper cloud scrolls. 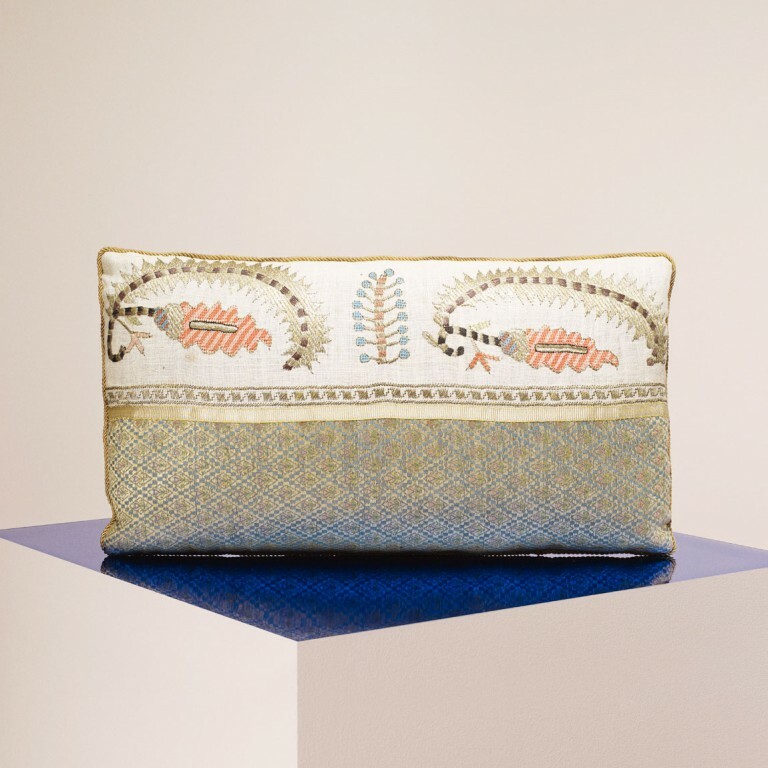 Motifs of waves and rocks in silver, cooper and blue threads form the lower portion of the embroidery. Multiple shades of blue, fuchsia, yellow, green and white are used to highlight a variety of different symbols on the upper portion of the embroidery. 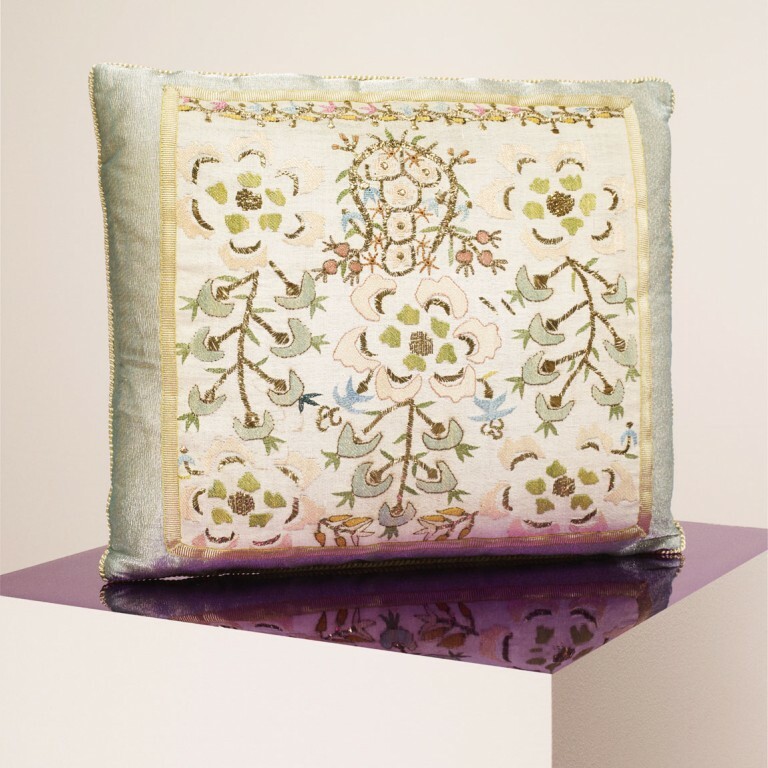 A border design is made of embroidered vine and floral motifs. The embroidery is mounted on vintage pale green sheer metallic fabric with a tiny silver metallic braided trim surrounding the embroidery. An 18th century Turkish Ottoman embroidered towel with an 18th century Persian silk. 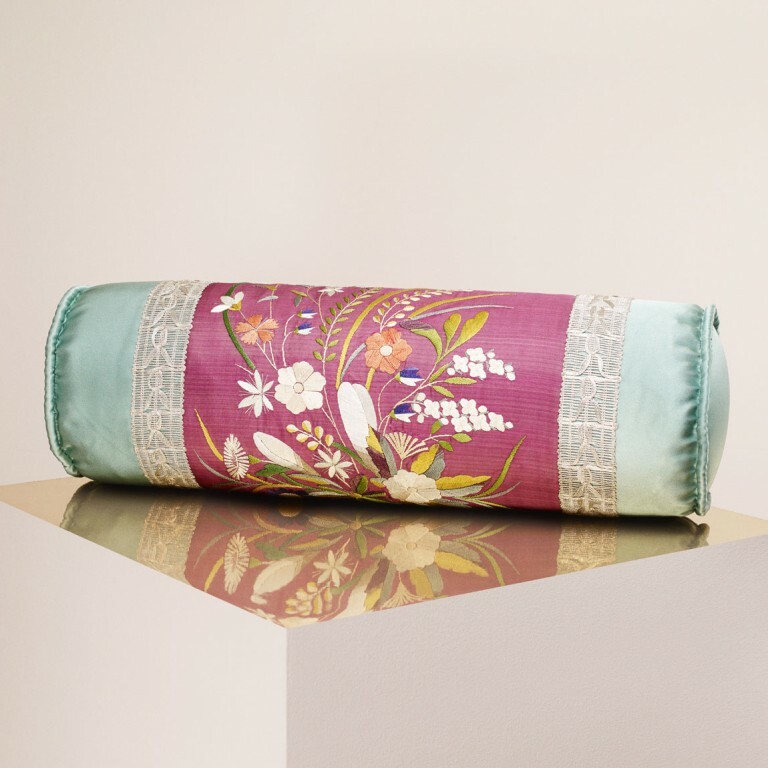 The embroidered linen gauze on the Turkish towel is worked in a bold design of abstract floral sprig motifs in vivid shades of coral, pink, blue and black silk thread and lustrous metallic gold-wrapping threads. 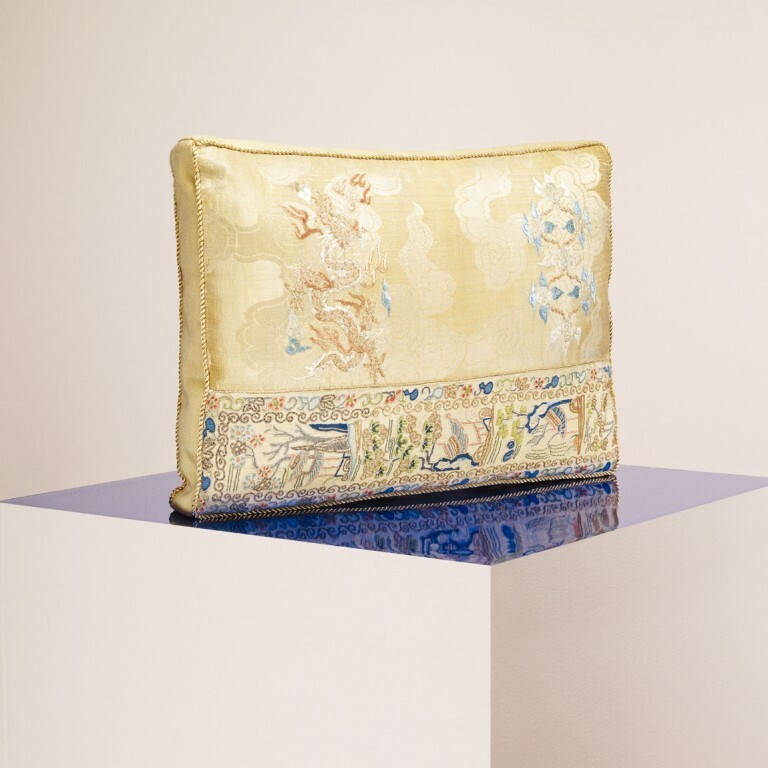 The bottom portion of the cushion is done in a Persian metallic gold and blue brocaded silk panel with a striking diamond lattice pattern enclosing stylized buds. A strip of vintage flat yellow metallic trim is mounted horizontally to separate the two textiles. An Italian 18th century striped wool, once a part of a chasuble, highlights both the front and back center of this pillow. The dazzling colors of the stripes consist of crimson, green, indigo, gold and white bands enhanced with subtle ombre gradations. The front outside panels are made up of contemporary fuchsia horsehair flanked by vertical strips of brown metallic banding. The back of the cushion consists of a second panel of the Italian stripe centered and bordered with 18th century blue silk bourrette. A striking combination of antique silks, at center front , a sleeve band of 19th century Chinese embroidered silk is placed centered over a shimmering red panel of 18th or 19th century Russian silk. Woven with thin strips of gold metal, this type of fabric is commonly called “cloth of gold”. The Chinese embroidery is worked in a polychrome silk floss in vibrant shades of blue, magenta, coral, celadon with metallic gold threads against an ivory satin ground depicting figures in traditional dress in riverside settings with lush vegetation and lotus flowers. An Indian sheer silk panel early 20th century brocaded with small parrot, peacock, stag and elephant motifs in shades of grass green, copper, peach and royal blue; the opaque silver decorative border is similarly figured with larger elephants and parrots. Twenty Antique knotted metallic silver buttons from a nineteenth century child’s Ottoman vest trims the panel with a single antique Turkish tassel with deep Saffron threads. 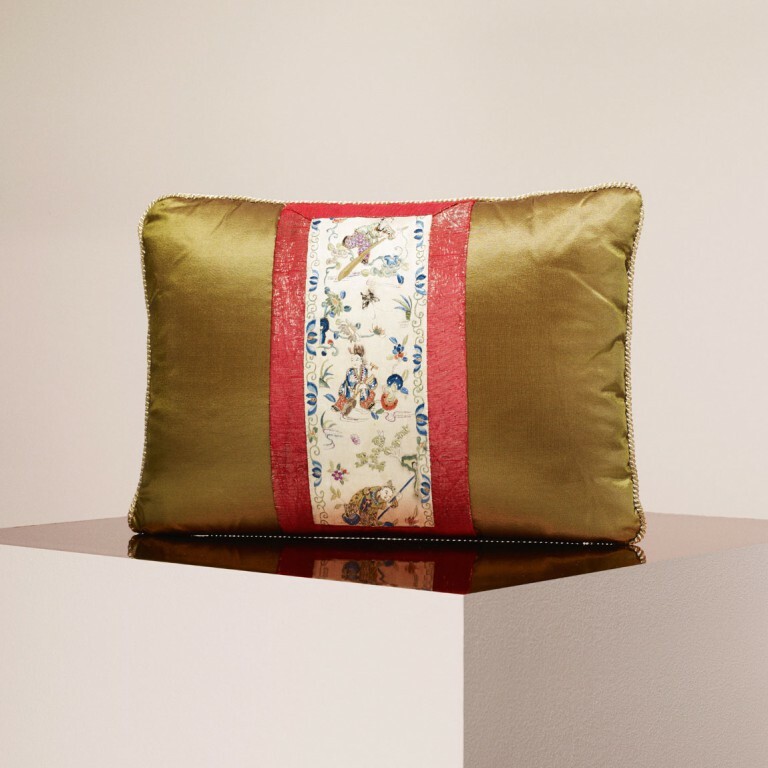 The bottom portion of the cushion is done in contemporary gold chartreuse double silk satin. Late 18th century embroidered ochre silk satin panels, once part of a man’s formal waistcoat. Worked primarily in shaded satin stitch, with pale blue, pink, yellow and white floral and foliate sprays with tulle insets over-embroidered in places lending additional texture to the needlework. A delicate vintage gold cord and silk buttons highlight the embroidered panels. 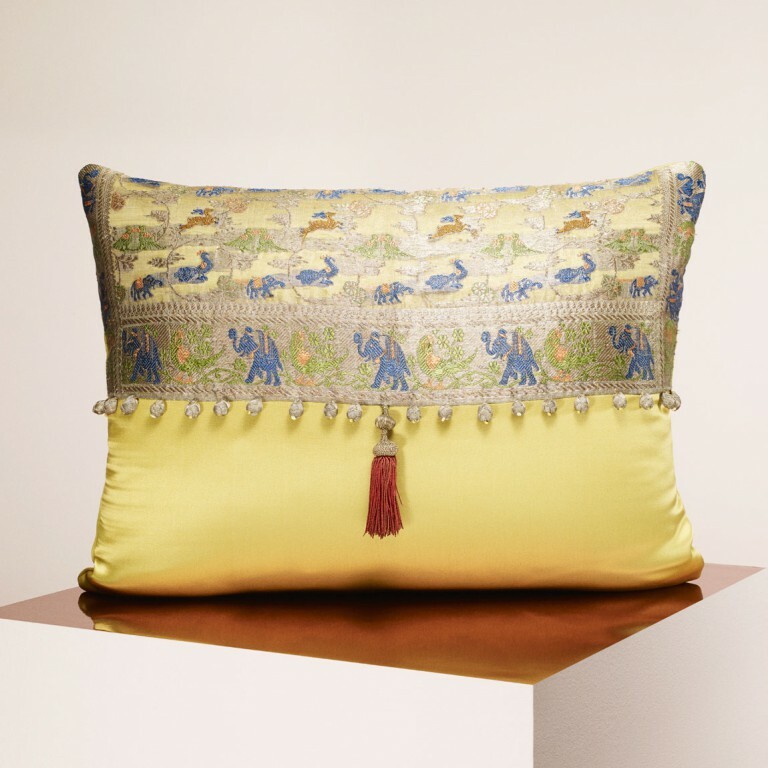 A foundation of contemporary ochre silk taffeta supports the applied embroideries. 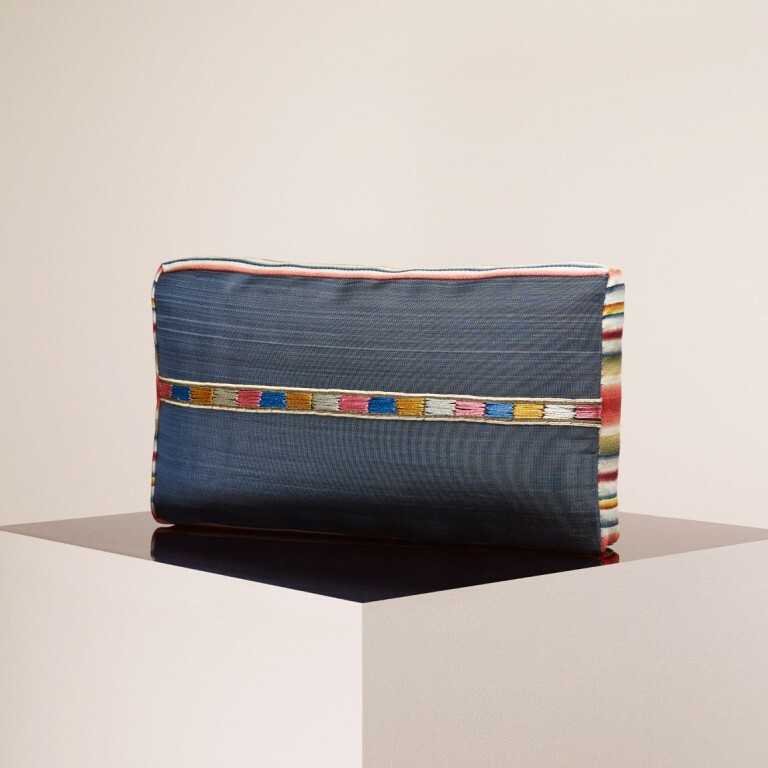 A vintage multihued band of trim with an array of colors accented with gold metallic thread mounted on contemporary indigo blue woven horsehair echoes the colors of an Italian 18th century striped wool, once used as part of a chasuble finish the sides and back of the box cushion. Contemporary indigo blue woven horsehair fabric with a central, applied panel of 18th or 19th century Russian silk. Woven with thin strips of gold metal, this type of fabric is commonly called “cloth of gold”, this particular panel was pressed to create a distinctive moiré finish. The panel is trimmed with vintage coral twisted silk cording, and each corner is accented with Japanese hand-painted porcelain buttons, each with a unique face depicting Noh theater masks. Dramatic antique embroidered appliqués, probably French in origin and dated to the late 18th century, were once a part of a man’s formal coat. Worked primarily in shaded satin stitch on a dark mahogany wool foundation, the pale blue, pink, yellow, green and white floral and foliate sprays are rendered in a naturalistic style; French knot accents add delicate textural details. 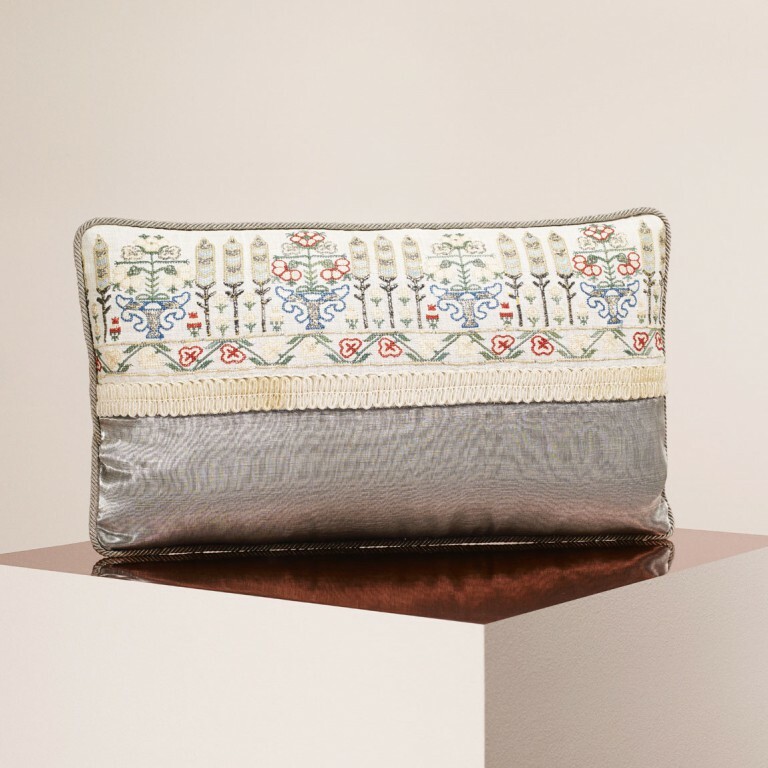 Vintage silver metallic scallop trim finishes the cushion’s edges. 18th century French silk embroidery, possibly from the skirts or petticoat of a woman’s gown. The two coordinating panels of pale café-au-lait silk are decorated with floral bouquets in soft pastel shades offset with deep indigo blue accents. 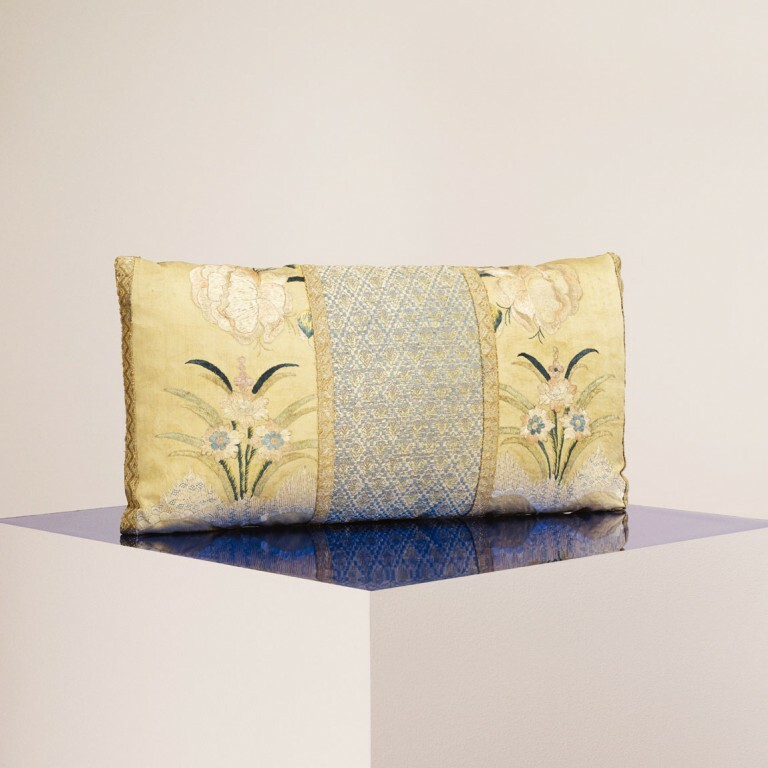 At the center of the cushion is an 18th century Persian metallic gold and blue brocaded silk panel with a striking diamond lattice pattern enclosing stylized floral buds. Antique metallic gold woven tape, once trimming for a liturgical garment, border the Persian silk and finishes the ends. Two antique 19th century Chinese embroideries combined. The narrow panel on the lower portion is a sleeve band intricately embroidered primarily in the technique of Forbidden Stitch or Peking Knots showing elaborate details of flowering trees and pagodas with polychrome silk threads and metallic stitching throughout. The wider panel is a pale bronze silk damask woven with cloud scroll motifs and embroidered with a dragon and metallic ogees linked with stylized flowers. 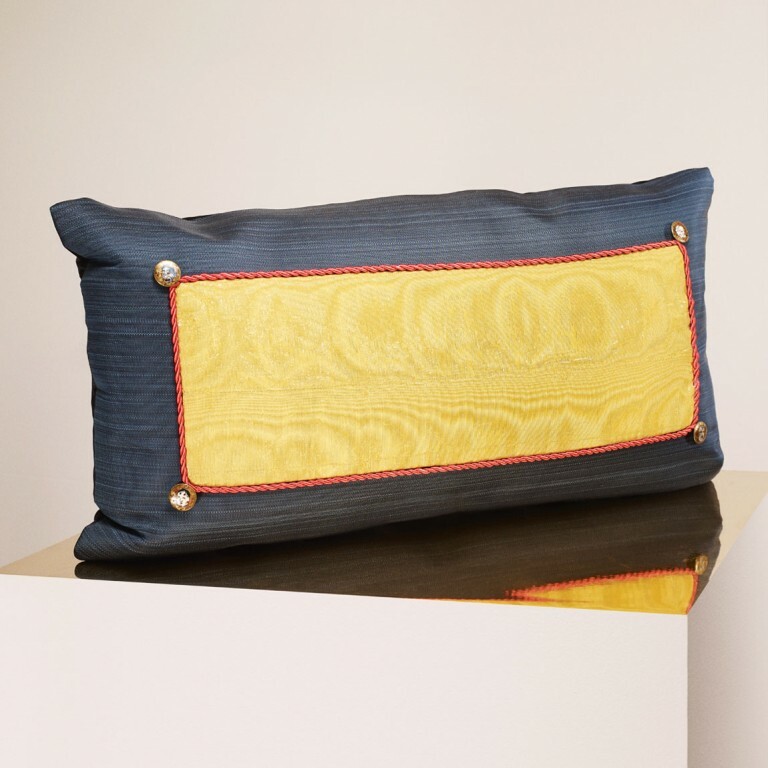 Vintage metallic gold cord finishes the outside edges of the cushion. A grouping of 19th century silk oriental embroidered appliques. 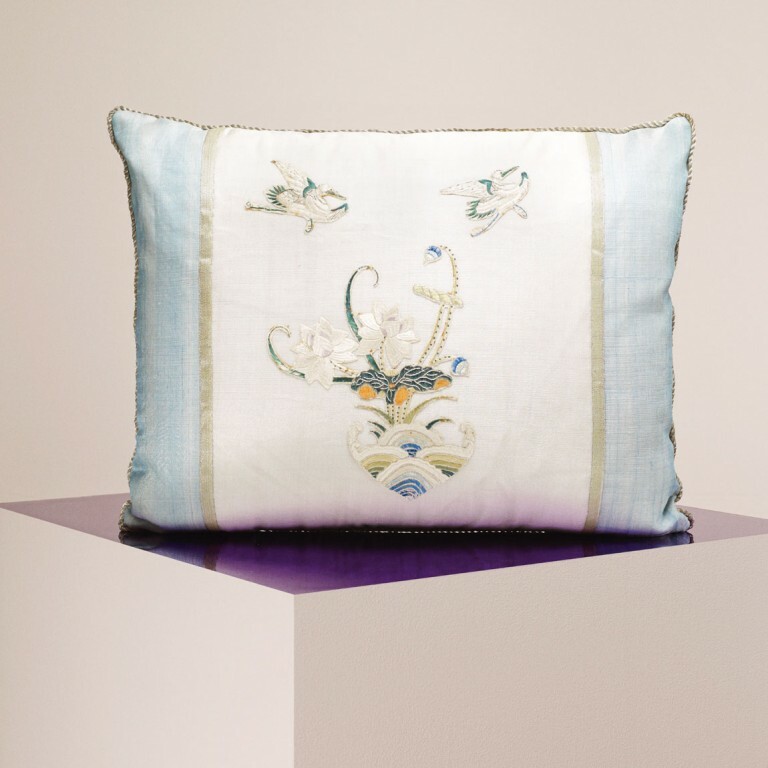 A floral bouquet of white peonies with delicate curved foliage over a cluster of multi-colored wave motifs highlight the center of the cushion with two embroidered flying cranes above. The appliques are mounted on vintage creamy white sheer metallic silk and framed with two vertical bands of vintage silver metallic flat trim. The outside borders of the cushion are finished in 19th century pale cerulean blue pina cloth. A 19th century Turkish Ottoman embroidered panel from a ceremonial towel in traditional reverse stitch with metallic silver, red, green, grey and cream threads showing tall trees and elaborate urns filled with floral rosettes intertwined with stylized flowers over a border of foliage vines in a zigzag pattern. The embroidery is bordered with a horizontal band of vintage scroll patterned iridescent cream horsehair trim over a double layer of vintage charcoal metallic moire silk ribbon and edged in contemporary silver metallic cord. A 19th or early 20th century Chinese export embroidered silk panel with polychrome silk threads showing a variety of different flowers and foliage in multiple shades of silver, cream, green, yellow, coral and purple with a magenta background. The panel is framed on each side with two wide bands of silver metallic thread trim and the outside borders done in a contemporary teal green double silk satin. A panel of 19th century Turkish Ottoman embroidered linen trimmed with vintage pale gold metallic ribbon and applied to vintage sea foam sheer green metallic silk. The embroidery is done in a floral rosette and sprig pattern worked in soft shades of aquamarine, shell, pink and green silk in a traditional reversible stitch. 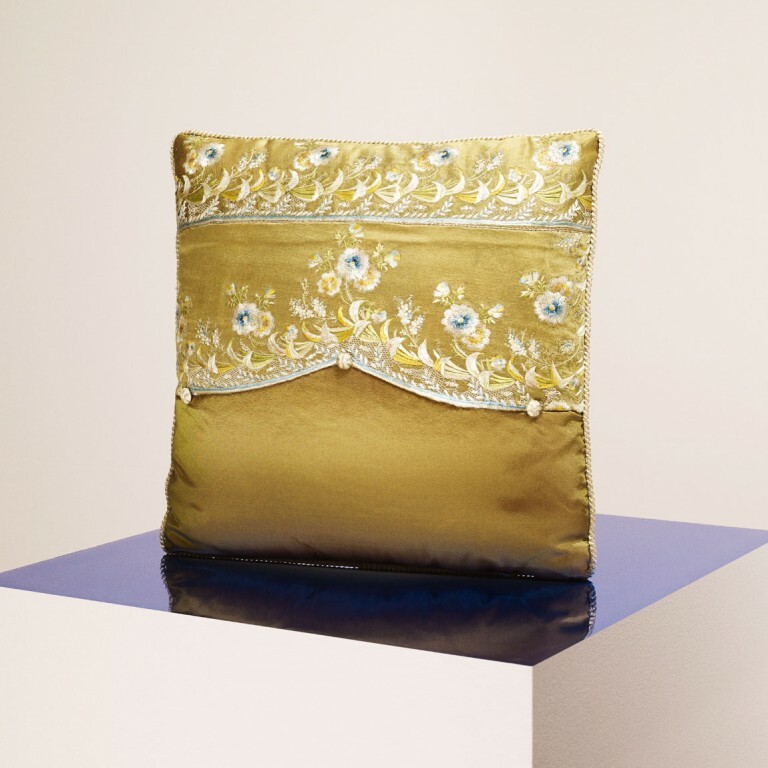 A vintage gold cord finishes the outer edges of the cushion.